"Lemon Drops" feature large (16mm), gorgeous briolettes of lemon quartz. They've been topped with loads of 24kt gold vermeil* rings. 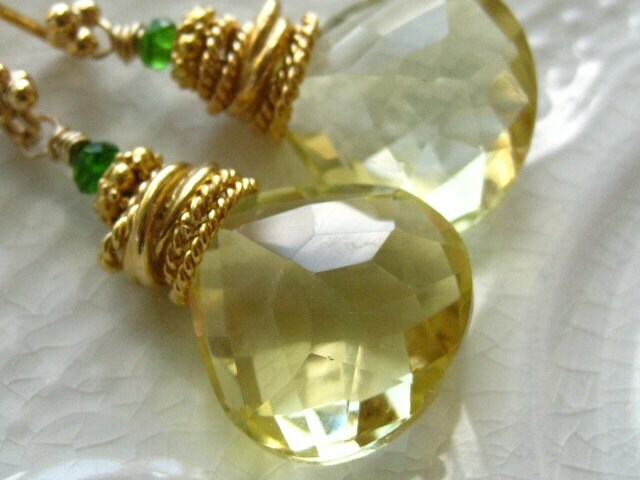 One tiny, emerald green chrome diopside rondelles tops each, to accent the yellow and gold. Elegant and luxurious statement earrings! Your "Lemon Drops" will ship USPS first class mail with tracking and insurance in the US, and will be packaged in a lovely gift box tied with ribbon.